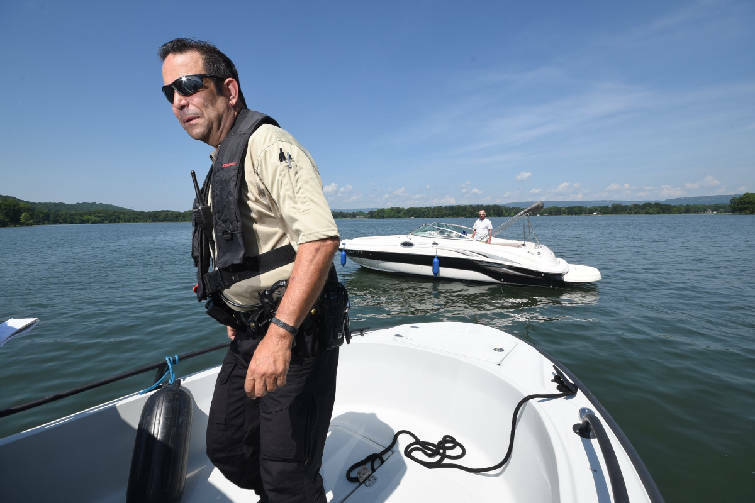 Hamilton County Marine Patrol Deputy Sam Roistacher, right, and J. Matt Lea, Hamilton County Sheriff's Office spokesman, approach a boat for a safety check on Lake Chickamauga near Chester Frost Park. POLL: Do you have a boat or personal watercraft? Hamilton County Marine Patrol Deputy Sam Roistacher completes his open water check of Joshua McDonald, of Cleveland, Thursday on Lake Chickamauga near Chester Frost Park. Hamilton County Marine Patrol Sgt. Matthew Purvis holds a life ring as he describes safety items required for boaters. Hope Wilkey is seen looking through the life ring as Sheriff Jim Hammond, right, stands by during the presentation Thursday at Chester Frost Park. Tennessee, Alabama and Georgia all have free fishing days when residents of any age can fish without a license and at no cost in all public waters. In Tennessee and Alabama, visitors can also fish public waters free, without a license, on free fishing day. Tennessee and Alabama will have a free fishing day on Saturday, June 9. Free fishing day in Tennessee is always followed by Free Fishing Week when children, ages 15 and younger can fish for free all week in Tennessee’s public waters. Alabama officials note that some fishing piers and lakes might still require fees and permits. Georgia will have three free fishing days; June 2, 9 and Sept. 22, but the offer is restricted to Georgia residents only. › Each year, and after a major storm, have the boat’s electrical system inspected and upgraded by a qualified marine electrician to be sure it meets the required area codes and those of the American Boat & Yacht Council. Check with the marina owner who can also tell you if the marina’s electrical system has recently been inspected to meet the required codes of your area, including the National Electrical Code. › The total number of registered vessels in 2017 was 248,475. That was a decrease of 6,005 from 2016. › The total number of reportable incidents in 2017 was 105. That was a decrease from 2016, which had 132. › The incident rate for 2017 was 42.3 per 100,000 registered vessels. This was a decrease from 2016. which was 51.9 per 100,000. › The bodies of water that reported the most incidents were Kentucky Lake and Norris Lake with 12 incidents each. › The county that reported the most incidents was Franklin County with eight. › The monetary amount of damage resulting from boating incidents in 2017 was $584,016. This was a decrease from 2016, which reported $1,252,545. › The most common type of boat involved in an incident was an open motorboat. › The leading type of incident was collision with vessel with 48 occurrences. › The most common operation during an incident was recreational cruising. › The leading primary cause of incidents was improper lookout. › Alcohol and/or drug use was a primary cause in 9.1 percent of incidents in 2017. This was an increase from 2016, which was 5.8 percent of incidents. › Rented or borrowed vessels were involved in 12.4 percent of incidents in 2017. This was a decrease from 2016, which was 20.5 percent of incidents. › The most likely time to be involved in an incident was between the hours of 4 and 8 p.m.
› The most likely day of the week to be involved in an incident was Sunday. › The leading age group of operators to be involved in an incident was 46-50 years old.